If you are in an organised tour as a part of the Aussie Camino this section will be omitted. While there is the scenic coastline of Discovery Bay to follow this is a very long stretch of the Great South West Walk (GSWW) pathway. There are non facilitated camping areas at Swan Lake and at Lake Mombeong. 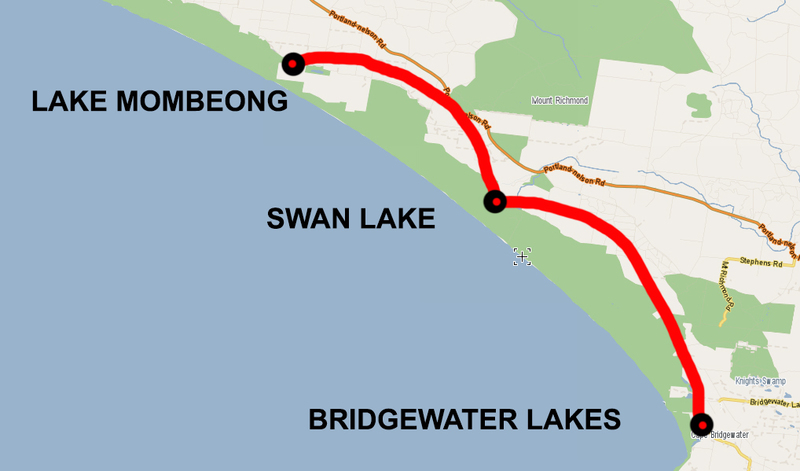 Unless you are a serious hiker it is recommended to arrange vehicle support or to skip this section entirely from Bridgewater Lakes to Lake Mombeong. If you decide to walk this section head out along water Bridgewater Lakes Road and up to Kennedys Rd. This will eventually turn into the GSWW. If you keep the dunes on the left and the plantation on the right it will take you to Swan Lake and then through to Lake Mombeong. Note there are no facilities at either camping ground so all equipment must be brought in or back up support is required. This is the trickiest part of the camino as the distance between Bridgewater Lakes and Nelson is very long. You have to make a judgment call about how far you can go on this day. There is no accommodation at Swan Lake or Lake Mombeong. If you don’t have a vehicle, arrange for a local bus driver to pick you up. I am sure this could be done. You could also get in touch with the Friends of the GSWW that have some good contacts in the region. You can either find other accommodation in the area or stay back at the camp at Cape Bridgewater. You could also drive ahead to Nelson and find accommodation near there.